Confederate tongue and wreath buckle, CS, keepers and wreath are plain artillery style, square proportions when clasped, cast, Confederate wartime manufacture. 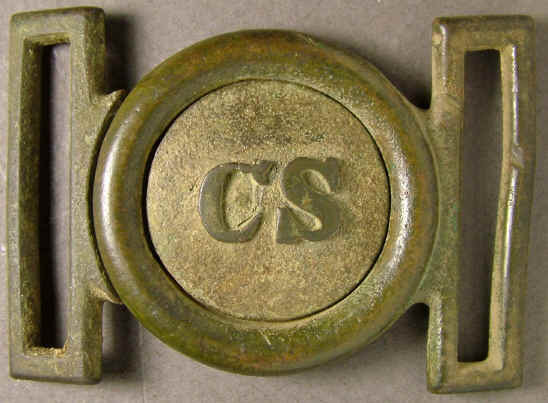 Buckle depicts "CS" and is a two part tongue and wreath plate used in the Confederacy. This style is noted for the unusually tall proportions giving it the appearance of nearly square proportions when both halves are assembled together. It was adapted from the earlier Federal style artillery plate, also featuring a plain unadorned wreath, but which featured much smaller rectangle proportions. Plate is thick casting, tongue disc bar is curved behind the disc, wreath has a channel. Ref: Mullinax Expanded Edition, Plates 066 or 067. 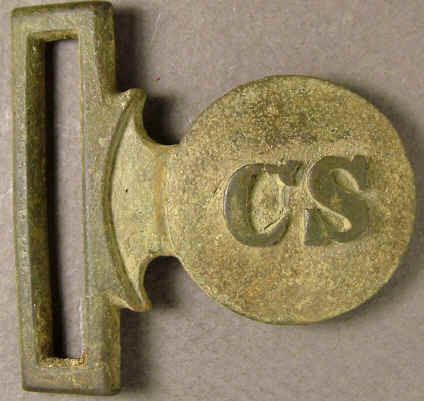 P0897...Confederate tongue and wreath buckle, CS, keepers and wreath are plain artillery style, square proportions when clasped, cast, Confederate wartime manufacture. 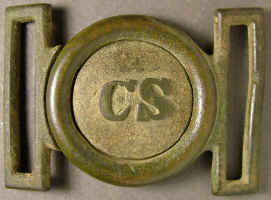 Buckle depicts "CS" and is a two part tongue and wreath plate used in the Confederacy. This style is noted for the unusually tall proportions giving it the appearance of nearly square proportions when both halves are assembled together. It was adapted from the earlier Federal style artillery plate, also featuring a plain unadorned wreath, but which featured much smaller rectangle proportions. Plate is thick casting, tongue disc bar is curved behind the disc, wreath has a channel. Plate measurements: tongue keeper 67mm, wreath keeper 67.5mm, wreath, 51.6mm. Dug plate, tongue and wreath have been married from two buckles, each part is correct style and fit. Recovered: Fredericksburg, Virginia. Authenticity note. This piece shows the definite ring around the letters and the slash in the "S" which is also in many Hanover Brass fakes! However there is a good bit of difference in the details on the back, and this plate is much larger than the Hanover Brass fakes. I have been able to confirm that this piece was owned by Shannon Pritchard in the 1990's, Shannon allowed Gary Williams to copy it. (Shannon now apologizes for ever letting GW touch this or any other buckle he ever owned, but that is a story for another time), Williams has also confirmed that he copied this tongue from Pritchard and did not copy the wreath. So this is the original from which Hanover Brass made the master for their repro and will be the only authentic example of this buckle configured with this funky ring and slash etc. 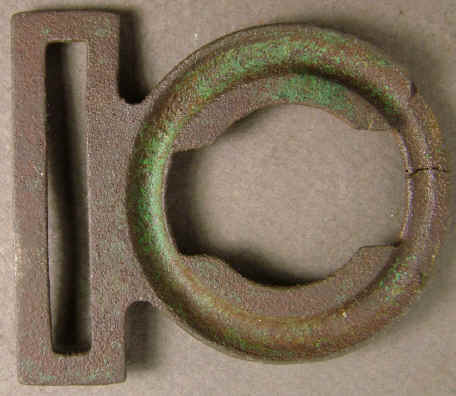 P1971...Confederate tongue and wreath buckle, CS, keepers and wreath are plain artillery style, square proportions when clasped, cast, Confederate wartime manufacture. 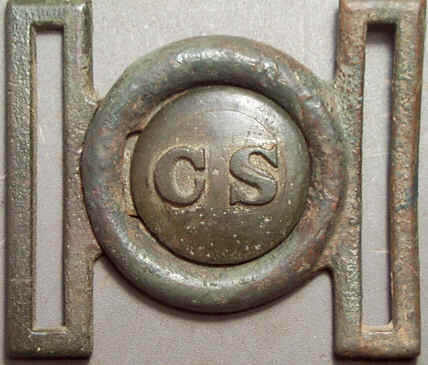 Buckle depicts "CS" and is a two part tongue and wreath plate used in the Confederacy. This style is noted for the unusually tall proportions giving it the appearance of nearly square proportions when both halves are assembled together. It was adapted from the earlier Federal style artillery plate, also featuring a plain unadorned wreath, but which featured much smaller rectangle proportions. Plate is thick casting, tongue disc bar is curved behind the disc, wreath has a channel. Plate measures: tongue keeper 66.8mm, wreath keeper 66.4mm, wreath 51.2mm. Recovered: Culpeper, Virginia by Butch Brown. Courtesy, the collection of Butch Brown. Authenticity note. This is the original plate dug by Butch Brown. Gary Williams, Hanover Brass, was allowed to copy this, a regrettable decision. Now there are many fakes of this piece floating in the market, see the Fakes section of this website for an example. This is the original from which Gary Williams has made his many fakes, so if you see one of those floating around out there it is not going to be real, this is the real one. 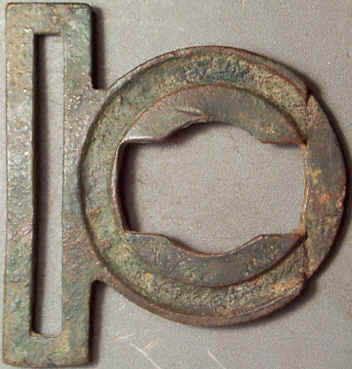 Buckle depicts plain motif and is a two part tongue and wreath plate used in the Confederacy. The Federal artillery plate featured US on the tongue, with plain wreath, the US was filed off in the field leaving a plain motif, usually there is faint outline of the original US. 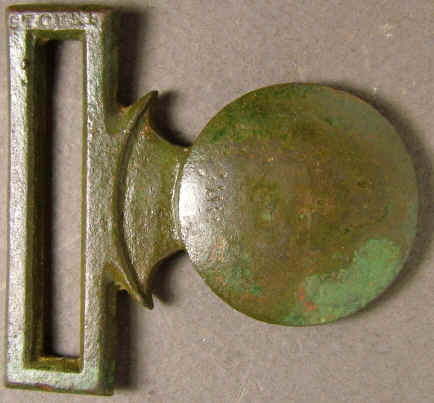 The plate is cast, tongue bar is flat with curved area behind the disc, wreath has a channel all the war around. Ref: Mullinax Expanded Edition, Plate 069. Ref: O'Donnell & Campbell, Plate 254. P0288. / P1318...Tongue and wreath buckle, US removed, plain keepers and wreath artillery style, cast, Confederate alteration of a Federal buckle. 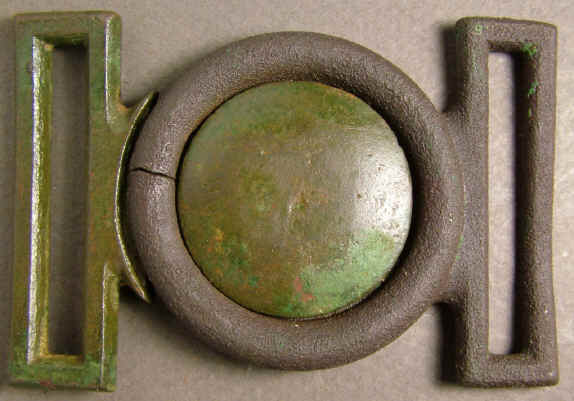 Buckle depicts plain motif and is a two part tongue and wreath plate used in the Confederacy. 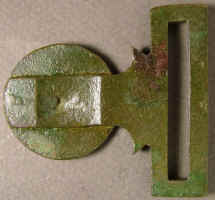 The Federal artillery plate featured US on the tongue, with plain wreath, the US was filed off in the field leaving a plain motif, usually there is faint outline of the original US. The plate is cast, tongue bar is flat with curved area behind the disc, wreath has a channel all the war around. This tongue was dug in 1964, another example of an artillery plate altered for the Louisiana unit, Washington Artillery, was found a short distance away, possibly this was a work in progress that never was completed. The wreath was never found, the wreath used is from a conventional federal plate, the fit is poor. Tongue is solid cast and has three stars stamped in the keeper. Recovered: tongue (P0288) Pumpkin Ridge, Clearbrook Virginia, by Harry Ridgeway in 1964, wreath (P1318) recovered Lexington, Kentucky. P0960. / P0974...Tongue and wreath buckle, US removed, plain keepers and wreath artillery style, cast, Confederate alteration of a Federal buckle. Buckle depicts plain motif and is a two part tongue and wreath plate used in the Confederacy. The Federal artillery plate featured US on the tongue, with plain wreath, the US was filed off in the field leaving a plain motif, usually there is faint outline of the original US. The plate is cast, tongue bar is flat with curved area behind the disc, wreath has a channel all the war around. 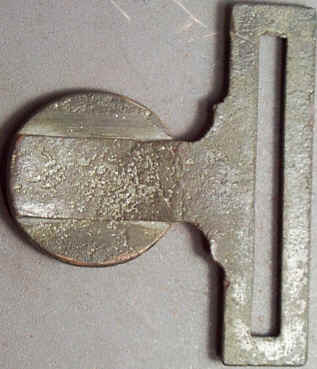 Marked "Storms" on the upper edge of the tongue keeper, a limited quantity of buckles and swords was produced by this contractor. Buckle is a marriage, fit is good, small break in wreath. 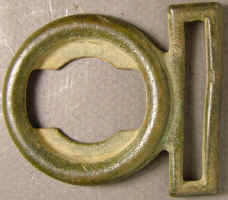 Tongue shows a casting flaw on the back, it is likely that the motif was removed from a plate, then used as a master, then these blank tongues were copied. Recovered: tongue (P0960) recovered Shenandoah Valley, Virginia, wreath (P0974) recovered Richmond Virginia, it is a good fit. Plate measurers: tongue keeper 55.6mm, wreath keeper 55.6mm, wreath height 49.5mm. 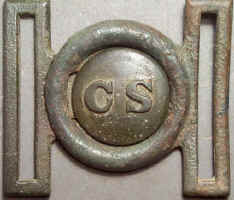 Buckle depicts CS and is a two part tongue and wreath plate used in the Confederacy. 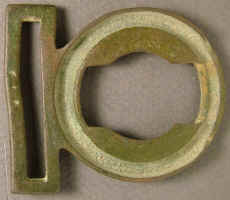 The Federal artillery plate featured US on the tongue, with plain wreath, the US was chiseled and hammered until the "US" was turned into "CS", this probably was the work of a jeweler. 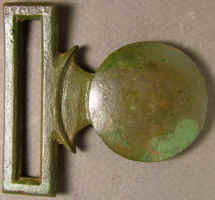 The plate is cast, tongue bar is flat with curved area behind the disc, wreath has a channel all the war around. Ref: Mullinax Expanded Edition, Plate 071. 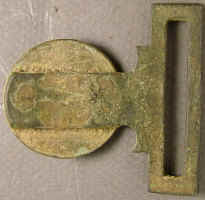 P1544...Tongue and wreath buckle, US altered to CS, keepers and wreath plain artillery style, cast, Confederate alteration of a Federal buckle. Buckle depicts CS and is a two part tongue and wreath plate used in the Confederacy. 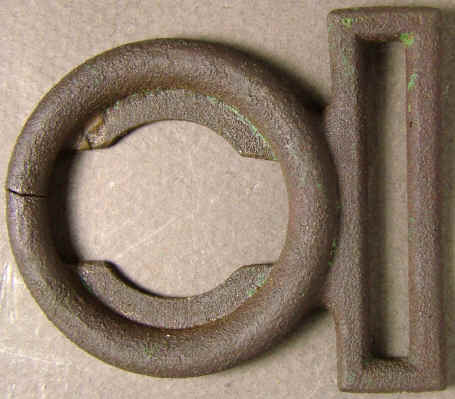 The Federal artillery plate featured US on the tongue, with plain wreath, the US was chiseled and hammered until the "US" was turned into "CS", this probably was the work of a jeweler. The plate is cast, tongue bar is flat with curved area behind the disc, wreath has a channel all the war around. Plate measures: tongue keeper 54.5mm, wreath keeper 54.1mm, wreath height 48.9mm. Dug plate, both halves found together. 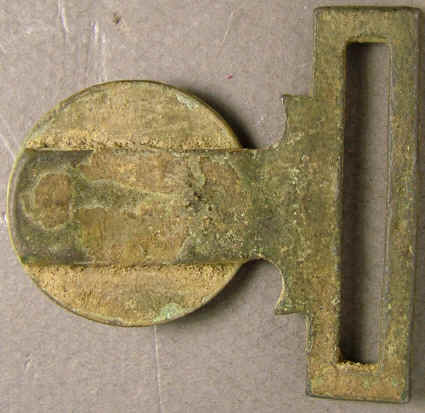 Recovered: Fredericksburg, Virginia. Ref: Mullinax Expanded Edition, Plate 071, this is the example published. A note about authenticity. The measurements noted above are the actual measurements and and although this is the piece actually published in Mullinax book, the measurements so stated are significantly different. Explanations obtained from either Mike O'Donnell or Steve Mullinax range from, "I don't know what happened" to "a rule was using and we made a mistake", to "the measurements were intentionally misstated so that if the fakers ever produce one of these sized as indicated, they would know it is a fake". I find this disconcerting, you can't have it both ways. This is part of why we are having such a difficult time with fakes, between the clever production from the fakers to bad information from the self proclaimed "experts", how can the average collector ever hope to figure it out?.